Kaizer Chiefs have named and shamed those who have been punished for the violent scenes that took place at last year's Nedbank Cup semi-final, with Kaizer Motaung having his say on the matter. 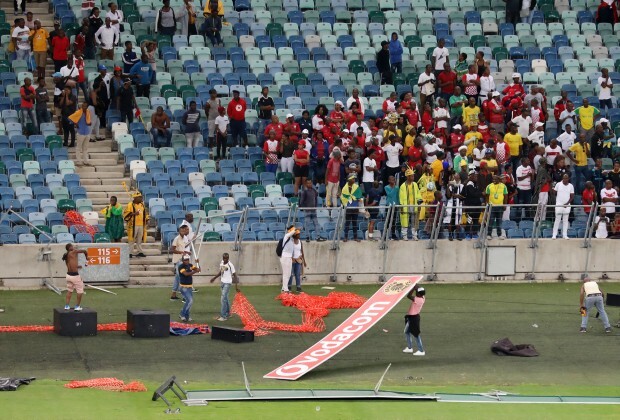 There were very unsavoury scenes last April in a clash between Chiefs and Free State Stars at Moses Mabhida Stadium in Durban, with several being hurt and millions of rands-worth of damage being caused. On March 29, nine people were found guilty of public violence and appeared at the Durban Regional Court for sentencing, one of whom has been handed a three-year prison sentence for his role in the violence. A club statement on Chiefs’ official website read, “Khwezilomo Madiba was handed a three-year jail sentence while the other eight co-accused received suspended sentences. The reason for a harsher sanction for Madiba was due to the fact that he had been found guilty of a similar offence previously. Meanwhile, Amakhosi chairman, Motaung, has welcomed the sentencing for what he calls ‘deplorable acts’ saying, “We truly welcome the sentencing of the nine people who were responsible for the injuries to security marshals and damages to property amounting to millions of rands. We hope this punishment sends a very strong message to all those fans who believe violence is the only answer when results don’t go their way. Chiefs were forced to play two games behind closed doors as punishment for the scenes in KwaZulu-Natal and will be hoping that they never see anything like it again. Without promoting hooliganism by our fellow mates, Chiefs management are to be blamed in that incident. KC is big club, thus they shouldn't leave this matter of hooliganism to the law enforcement agencies only. The club has resources that can be directed towards educating the fans abt good behaviour. The should also stop this thing of employing coaches who continue to break our hearts.